Looking for Castlevania: Lords of Shadow 2 cheats on PS3, Xbox 360 & PC? Here we’ll list Castlevania: Lords of Shadow 2 cheat codes and unlockables with tips for Konami’s new action-adventure game. •	How to unlock “New Game+” mode: Finish the game once. 1. Buy the “Castlevania: Lords of Shadow 2 – Dracula’s Tomb Premium Edition” to get all three. Available at Game.co.uk. 2. Pre-order “Castlevania: Lords of Shadow 2” at participating select retailers to get a single one. For example: A) The “Dracula Armor” Skin is a GameStop exclusive. B) The “Dark Dracula” Skin is an Amazon exclusive. C) The “Relic Pack” is a Best Buy exclusive. 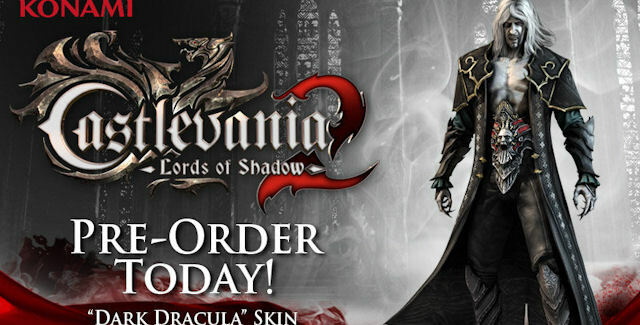 •	In-Game “Armoured Dracula” Skin – An all new, highly detailed “Dracula Armor” costume for the famed Lord of Darkness, Dracula of Castlevania: Lords of Shadow 2. Includes a full length, leather textured coat with new filigree designs throughout and completely redesigned central belt armour. New battle greaves and pants with adorning paraphernalia add a powerful finish. Dracula himself has a new beard to complete the look. — Example download code for the Armoured Dracula DLC: HT28-ERN4-5JE? •	In-Game “Dark Dracula” Skin – Alternate colouring for Dracula’s iconic costume from Castlevania: Lords of Shadow 2. Taking its cues from the classic designs of past Castlevania games, this costume includes the classic white hair & beard colouring for the ultimate Prince of Darkness. •	In-Game Relic Pack – Gives you access to most of the game’s relics once you find your first drop. These each have a different effect, some enhance your skills, some enhance your abilities, while others have a more mysterious and surprising effect! Using the exclusive transmutation rune offered in this pack, players can change relics at will allowing them to always have the best one for any given situation. PS: There’s also been word on the internets that “Alucard DLC” is on the way! Dave Cox, Producer of Castlevania: Lords of Shadow 2 and Studio Head of European Production for Konami Digital Entertainment B.V and Enric Alvarez, Head of Development at MercurySteam, discuss environments across time, Dracula’s influence on his setting and the signature Gothic look of Castlevania: Lords of Shadow 2 are all revealed in this developer diary. In the first Castlevania: Lords of Shadow game, entering the Konami code on the loading screen opened the Cheats Menu. Maybe it works again in the sequel? •	Enter the Konami code on PS3: Up, Up, Down, Down, Left, Right, Left, Right, O, X. •	Enter the Konami code on Xbox 360 & PC: Up, Up, Down, Down, Left, Right, Left, Right, B, A. Note: Using any of the Cheats you can turn on, will disable earning Achievements/Trophies and locks your Save File, preventing you from saving. Until more Castlevania: Lords of Shadow 2 cheats are discovered on PC, Xbox 360 & PS3, we made the handy Castlevania: Lords of Shadow 2 guides listed above to help you with tips and tricks for the game! Do you know of any Castlevania: Lords of Shadow 2 cheats or unlockables?